Many times your windows PC/laptop’s normally gets virus(any type of malware like trojan, worm, spyware) because of Pen Drives or USB devices (Even PC’s who are not connected to network ). Many virus exist like Ravmon Virus , Heap41a worm which are not detected by many antiviruses normally and spreads mostly by the Pen Drives using autoruns. You are seriously recommended to disable your autorun feature on your windows computer. But if still your PC and USB is infected with virus you cannot control over them. In such a case what can you do to prevent your PC from getting infected with Virus that spreads through USB devices or Pen Drives ? You can protect your PC by just following the simple steps below . It won’t take much time. Connect your Pen Drive or USB drive to your computer . Now a dialogue window will popup asking you to choose among the options as shown in the figure. Don’t choose any of them , Just simply click Cancel. *Now go to Start–> Run and type cmd to open the Command Prompt window . (On windows 7 , vista or later search for run using search option from start menu). *In the Command Window ( cmd ) , type the drive letter: and Hit Enter .. If you find any one of the files above , Run the command attrib -h -r -s -a *. * and Hit Enter. Now Delete each File using the following Command del filename ( E.g del autorun.inf ) . Now just scan your USB drive with the anti virus you have to ensure that you made your Pen Drive free of Virus. You should also find out suspicious hidden folders where malwares hide themselves instead of root location as above. Remember it’s only one way to remove viruses from a infected removable memory disk. There are some other methods to do it. 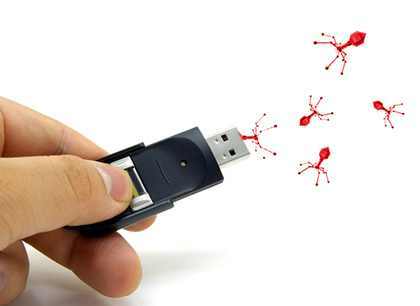 And this can be very backdated method to remove viruses from USB sticks. In future more effective tips on blocking removable disk viruses will be available on TechGainer. Wethink this is an excellent blog. Having your pen drive getting infected from worms is quite easy, and getting rid of them is quite difficult. In case when the controls of windows explorer has been taken over, DOS comes to the rescue. This article will benefit many, I am sure. This system cannot find the file specified. tnx for your knowledge..now i know..